AN internationally renowned theologian and Dominican priest has questioned why 110 young Australians have gone to fight for the terror group ISIS in the Middle East. 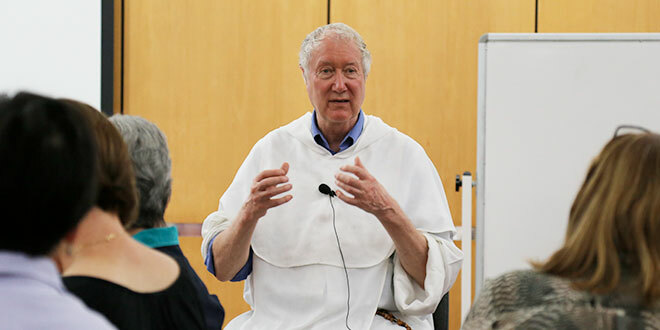 Fr Timothy Radcliffe, who was Master of the Order of Preachers from 1992-2001, raised the issue of extremism and martyrdom during an audience with Catholic parishioners in Brisbane. “Why are they drawn to this awful death cult? It is partly because it (ISIS) demands everything,” Fr Radcliffe said. Fr Radcliffe, the director of the Las Casas Institute of Blackfriars in Oxford which focuses on promoting social justice and human rights, said we lived in a “risk averse society terrified of danger” which “stifles life”. “I was so pleased when six young friars were sent to work in the camps in Northern Iraq this summer,” he said. “And everybody said ‘Oh, but they might get hurt’. Fr Radcliffe spoke of the big challenge of touching the imagination of Christians who don’t go to church. “Christianity isn’t part of your life-support system like going to the gym or therapy, Christianity is the radical invitation to follow Jesus Christ,” he said. “And that is an exciting, terrifying adventure. On his fourth visit to Brisbane, and as a guest of Evangelisation Brisbane, Fr Radcliffe, came to the O’Shea Centre, Wilston, on May 10 to speak on the topic “Can we make room for the conscience of the laity – the challenge of Amoris Laetitia”. About 80 parishioners from across Brisbane archdiocese and beyond listened attentively as Fr Radcliffe delivered an intimate and pastoral response to difficult questions of family life and celebrating the joy of love. He touched on questions of personal conscience, interpreting the authority of the Church, and going to Communion for the divorced and remarried. Fr Radcliffe described a healthy conscience as being like a pair of lungs that breathed in and out. Breathing in, he said, was like exploring a private inner place at the core of a being “where God addresses me”. Breathing out was to reach out to the Church, and God’s teachings, and to the saints and the people who inspired us. “Only if we have a strong community will we flourish as individuals,” Fr Radcliffe said. He moved on to talk about absolutism and “the tyranny of tradition at the exclusion of creativity”. Fr Radcliffe developed this idea to talk about marriage, divorce and Communion. He said the third century Church had excluded some parishioners “forever”, before a pope decided to change the discipline so people who had been excluded could come back to Communion. “We’re in a similar moment now, when faced by so many good people whose marriage has collapsed – honest, kind people – now we, as the pope in the third century, have to say mercy must prevail,” Fr Radcliffe said. If divorced people can face their own responsibility and failure, if they faced up to what they had done and been, then maybe the best thing was for them to come back to the medicine of the Eucharist. Fr Radcliffe said being true to your conscience was not just “looking inside yourself and if you like it do it”. “We’re talking about something in the Church’s tradition much more subtle and beautiful – you are listening to the voice of the Lord as he echoes in your heart,” he said. “But usually you just hear a whisper, and we will need help from wise people as we discern what the Lord is saying.